Eighteen Arsi-Bale (local) and 18 Boer × Arsi-Bale (crossbred) male goats, initially approximately 10 months of age, were used in a 12-week experiment to investigate potential interactions between genotype and nutritional plane in growth performance, carcass and skin characteristics, and mass of non-carcass components. Grass hay (6.7% crude protein and 71.9% neutral detergent fiber) was consumed ad libitum supplemented with 150, 300, or 450 g/day (dry matter; low, moderate, and high, respectively) of a concentrate mixture (50% wheat bran, 49% noug seed cake, and 1% salt). 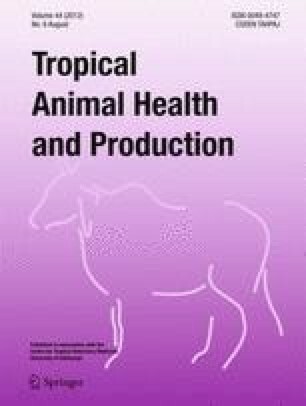 Initial body weight was 20.7 and 14.0 kg for crossbred and local goats, respectively (SE = 0.36). Hay dry matter intake was greater (P < 0.05) for crossbred vs. local goats (461 and 429 g/day) and similar among concentrate levels (438, 444, and 451 g/day for high, moderate, and low, respectively; SE = 4.7). Average daily gain was greater (P < 0.05) for crossbred than for local goats (36.6 and 20.8 g) and differed (P < 0.05) among each level of concentrate (43.7, 29.6, and 12.8 g for high, moderate, and low, respectively). Dressing percentage was similar between genotypes (41.1% and 41.1% live body weight for crossbred and local goats, respectively; SE = 0.59) and greater (P < 0.05) for high vs. low (43.5% vs. 38.7% live body weight). Carcass weight differed (P < 0.05) between genotypes (9.23 and 6.23 kg for crossbred and local goats, respectively) and high and low (8.80 and 6.66 kg, respectively). Carcass concentrations of physically dissectible lean and fat were similar between genotypes and high and low concentrate levels. There were few differences between genotypes or concentrate levels in other carcass characteristics such as color and skin properties. Relative to empty body weight, the mass of most non-carcass tissues and organs did not differ between genotypes. However, the low concentrate-level mass of omental–mesenteric fat was greater (P < 0.05) for local vs. crossbred goats (1.06% vs. 0.54% empty body weight, respectively). In conclusion, growth performance and carcass weight advantages from crossing Boer and Arsi-Bale goats were similar with a low-quality basal grass hay diet regardless of level of supplemental concentrate.